At its heart, this is a more powerful Alpina B4, available as a coupé or convertible and as a B3 S with saloon or Touring bodywork. For a tuning house keen to make clear that its job is not to tread on the toes of BMW’s M Division, the figures make for interesting reading. But before that, a quick look as what’s been done. These new S models are not additional to the B3 and B4 range, but replace them. That said, the chassis has been left unchanged - because Alpina says it didn’t need changing - so what we’re looking at here essentially is a powertrain job. As before, the host unit is BMW’s N55 motor but with its block recast to accept Alpina’s twin-turbo application. It has a forged steel crank, 10% bigger turbos, 20% more cooling capacity for the water and 35% more capacity for the oil. And again, the sound of the motor is spat out through Akrapovič exhausts. The automatic transmission is strengthened, has a bigger step between Drive and Sport modes and offers quicker shifts. This work raises power by 30bhp to 434bhp and torque by more than 10% up to 486lb ft. So, Alpina’s hot 3 Series and 4 Series-based models are now more powerful than BMW M’s equivalent propositions, and offer a stack more torque. Yes, the M cars are lighter (78kg for a two-pedal M4), which means they just manage to hold a fractional power-to-weight ratio advantage, but in terms of the arguably more important torque-to-weight ratio, the Alpinas are a distance ahead. 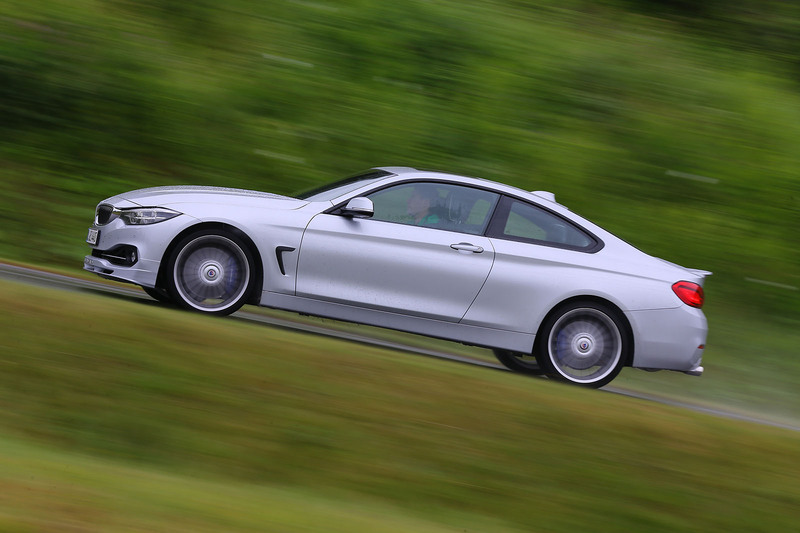 The Alpina is more expensive, but by less than £2000. It should also be mentioned here that while the Alpinas are automatic-only, unlike their M car equivalents, they are available with rear or four-wheel drive. The unchanged chassis retains Alpina springs, dampers and bars and comes with additional front camber relative to the M3 and M4. Forget that the figures point to a mere 0.1sec improvement in 0-62mph time, as traction limitations render such news worse than meaningless. Whereas the B4 always felt undeniably rapid, the rear-wheel-drive B4 S coupé we're driving here is a serious high-performance machine. And it’s not difficult to see why: it’s not the power but that additional torque in the middle of the rev range that provides real-world performance a clear step ahead of its predecessor. The motor’s throttle response is almost as good as a normally aspirated unit and its unadulterated sound is actually better than most. I had feared this extra grunt might ask questions the unchanged chassis would struggle to answer, but, on the track at least (which was the only place I was allowed to drive it), it did just fine. It’s a softer car than the M4 and there’s a price to be paid in body control through very fast corners and over undulations, but it never feels nervous, as an M4 can, and instead of skidding suddenly when power overwhelms grip at the back, it slides beautifully. I expect its lap time would still lag some distance behind that of the M4, but it would be interesting the measure the width of the smiles on each driver’s face at the end of a stint. 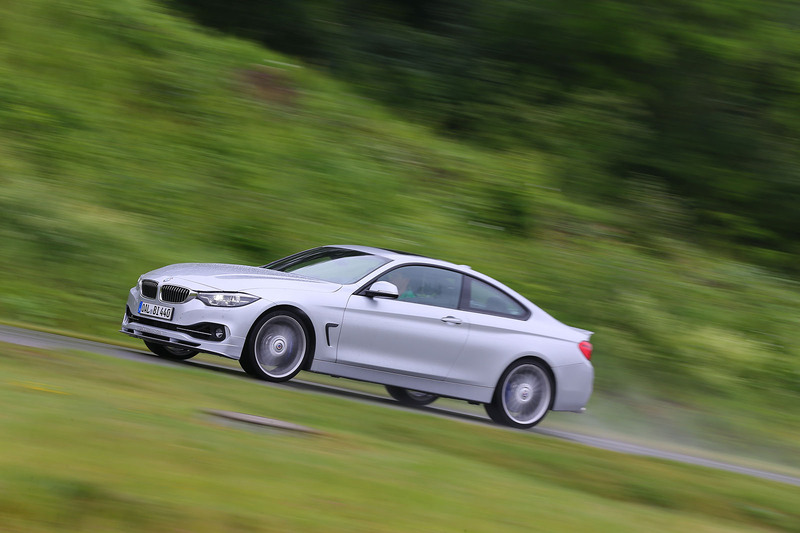 The M4 is a quicker, more exciting car than the B4 S, although not necessarily for all the right reasons. In the traditional Alpina way, the B4 S is more subtle, considered and aimed at those who don’t want to trumpet their arrival too much. A while back, we drove a B4 alongside an M4 and considered the Alpina the far more rewarding and satisfying driver’s car, not to mention being somewhat easier to live with. I can see no reason why the more punchy B4 S would not do at least as well in the same comparison, probably better. Even just seen as a car its own right, the B4 S has a character you don’t find elsewhere. So forget the comparisons, and focus instead on the fact that this is a car of real class and charm. What’s more, with Alpina only selling around 150 cars of all kinds in the UK each year, if you bought one, the chances of seeing another like yours would be almost nil. Sounds like the current incarnation has lost none of the ingredients that make an Alpina special and collectively more than the sum of its parts. Having owned Alpinas in the past I'd definitely consider another - maybe a B3S Touring with 4wd as a rapid load lugger...Past experience with two coupes (e36/46) showed them to be quick, unfussed by our substandard roads and rewarding to drive - also they BMW base gave a Q car feel, less visible and only of interest to those in the know. Sounds very impressive. And rams home just how far the M cars have fallen from their genuinely special past. Do we really need another review of a BMW? Or a Porsche or a Audi? Do we really need to hear about every possible combination of those cars? I surely don't. But maybe that's personal. Now, if the same attention was paid to more relevant cars, it would be different. But it seems Autocar is squarely in the pockets of the German car brands, spouting their marketing bs. Maybe Autocar could start testing the average BMW (if they still need their fix) as they are being sold. The boggo standard 316 with cloth seats maybe? They along with other makers are the Cars of the moment there's no denying that,but,to stay on topic,for less than a few grand difference the Alpina inside is a little more special,performance?....other than being unchained for top speed (190 v 155mph,irrelevant) your better with the M4, so spend the difference on some extras on your new M4. If they are the cars of the moment (and sales figures say otherwise, however common they have become), it's publications like Autocar that made them that. Going on, and on, and on about how 10 more hp really make a difference... not testing the most sold models, but mainly the fancy ones, with all the bits thrown in that the general public will not ever see on their 316 company car. How relevant is that? Sorry Peter but I can't agree with you on this subject. Having owned Alpinas over the years and test driven their M counterparts the recent iterations of the M3/M4 haven't been anywhere near as good in the real world. The early e30, e36 and e46 M3s were all much more special but the current car felt skittish and unsuited to British roads. It felt to me that owning it would have required on the road handling compromises that shouldn't have been necessary (though it would have been better on the track but most drivers don't spend every day on the track and if they do there are more focussed options than the M3/4). The Alpina B3S that I drove felt more supple, more exploitable (power wise) and more comfortable as well. Just as this article says, the Alpina's focus on torque has akways provided more immediate response, without having to wring out every last rev. Everyone has their own opinion but from my own experience I think you're wrong in your viewpoint on this one (no offence), Mark. Alpina now make the very best BMW's. I'm grateful they exist because I think BMW has strayed a little too far from what made it such a successful company in the first place. Sounds mighty impressive. I imagine the price difference without discounts though is larger.